One of the privileges of my job is that I am often invited to travel the world to share my expertise. This may be for festivals, schools or conferences. As far as conferences and school are concerned, I used to reduce my fees, on the basis that overseas travel is so rewarding and that the hosts would also have substantial expenses to cover. However, I quickly realised that overseas travel is extra-exhausting, more so when not for the purposes of a holiday and the administration occupies far more time than a trip within my own country. Therefore, I need to keep my fees robust and can’t accept too many trips each year, much as I’d like to. I have to balance the desire to say yes with the knowledge of the time and energy it will cost. To give you an idea of trips I’ve made, here are examples from recent years. 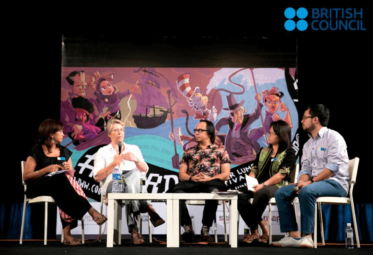 The first longhaul trip I made was to Kuala Lumpur for the British Council and from there to an International School in Brunei. It was an extraordinarily exciting trip but I took at least a week to recover and be able to work once I got home! 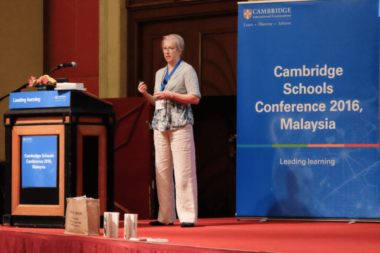 More recently, I travelled to Kuala Lumpur again, for the Cambridge International Examinations conference; CIE also generously took me to Hong Kong for their super-well-organised conference. Travelling Business Class for those trips taught me the vast improvement in my ability to work well when I got there and also how much this reduces recovery time. This is why I now almost always insist on Business Class travel for long-haul trips. I am not a spoilt diva – it’s purely functional: I can’t afford to wreck my ability to work. These trips are not holidays, trust me. Exciting, yes, but very hard work. Apart from festivals, I would generally be very reluctant to work without a fee – it is not fair on my family, my health or my fellow authors and professional speakers. 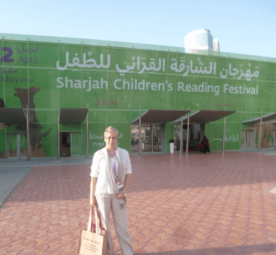 But it’s not impossible if the circumstances are right, and book festivals are often an example of that. If I’m not being paid, I would not expect an exhausting time-table, though. In 2016, I visited a school in Jakarta, spending three days working with staff, parents and students, which was very rewarding. You might be interested to know that I flew Economy on the way out (this was the last longhaul working trip I did in Economy) but paid for a Business Class upgrade on the way back, which I was able to do because they were paying a decent fee and I judged it to be worth it for the sake of my ability to work on my return. I say all that so that you understand my thinking when deciding whether I can accept your kind invitation and also what my fee would be. I want to work brilliantly for you and this is how I can. My brain works incredibly hard when I do public speaking – it’s high energy stuff. I do not stand there leaning on my lectern and reading at you. I speak mostly without notes and you get a bespoke presentation which I work hard to make perfect for you. Travelling, especially alone, is very stressful and I, of all people, know how to avoid stress-related underperformance! I’ve also worked in Tenerife, Paris, Prague, Madrid, Stockholm and other places. I’ve had to say no to many more but always with regret, including Ankara, Nigeria and Bogota for 2018. Whatever fee we agree, and certainly if there is no fee, you will need to cover all my expenses from the moment of leaving home. I always keep these to a minimum but typically they include: airport transfers; food and water in all airports; hotel accommodation; all meals; all transport to and from locations; flights and booking fees; airline baggage costs; visas; wifi and phone usage if required. Do build in enough time for a delay. For example, if I’m to work with you on a Tuesday morning, I would ideally need to arrive the previous morning, to allow for recovery and possible delays. Tell me your proposed time-table and budget so I can suggest how to make the time-table fit the budget. There’s usually a way! I will speak to very large audiences, so we can make the trip good value for you. Even if you’re asking me to focus on 2-3 particular year groups, for example, I could still talk to the whole school in assembly. Don’t be afraid to ask! The worst that can happen is that I say I can’t do it! But I will try to say yes. Thank you for considering inviting me. I very much hope to be able to accept.